In the fast paced lifestyle of the radically sabbaticaling there is little time to rest. No sooner had Donna and I landed in San Francisco in early December than we were busy running errands and preparing for our next adventures. The plan was that we would once again part ways for the first half of the month. Learning even more Spanish was beckoning Donna, but this time her thinking was she should be really fully immersed in order to get the most out of another 2 weeks of Spanish school. Although Bariloche had lifted her Spanish off the ground to a basic understanding, she knew that in order to learn in the most effective way, she would need to travel alone because when we traveled together we would always end up speaking English with one another. Also, my better Spanish often meant I did most of the talking in situations when we were together. Thus Donna decided that she would go to Spain… and you’ll have to wait for her post to read about how it went! My prerogative was to head to Colorado in order to take a mountaineering course with my friend Colin (remember him, from the China trip?). Two years ago the world of backcountry snowboarding opened up for me when I took an avalanche safety course in Tahoe. That experience and my subsequent backcountry tours in the Sierras, Iceland and Argentina, had given me a base level of experience but also reinforced a couple of critical points. 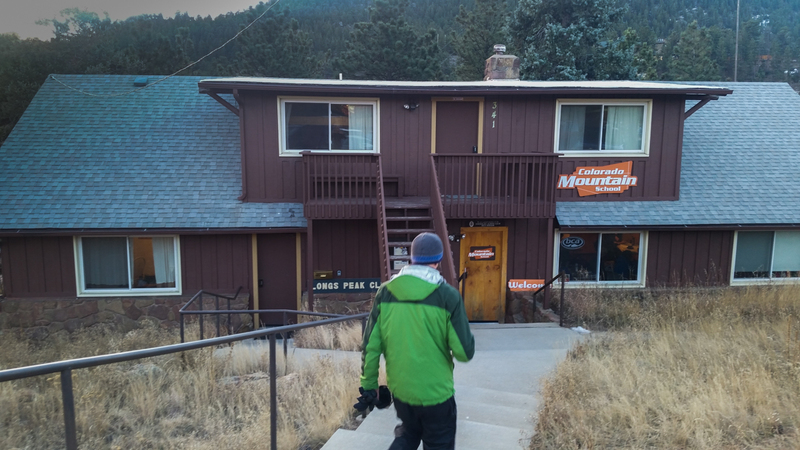 The first is that the mountains and backcountry environments deserve the utmost of respect. 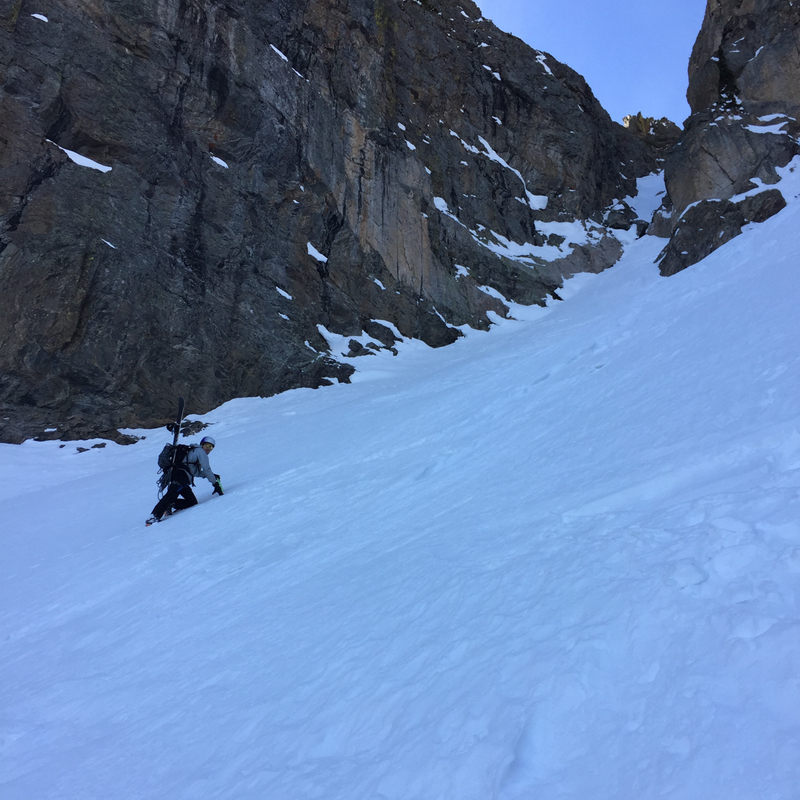 Avalanches kill, bad weather can move in swiftly and catch one off-guard, and terrain needs to be properly understood. Secondly, the best one can do to pay their respect is to act intelligently and to prepare oneself mentally and physically. Towards that end, constant learning, vigilance, and conservative decision making are of paramount importance. 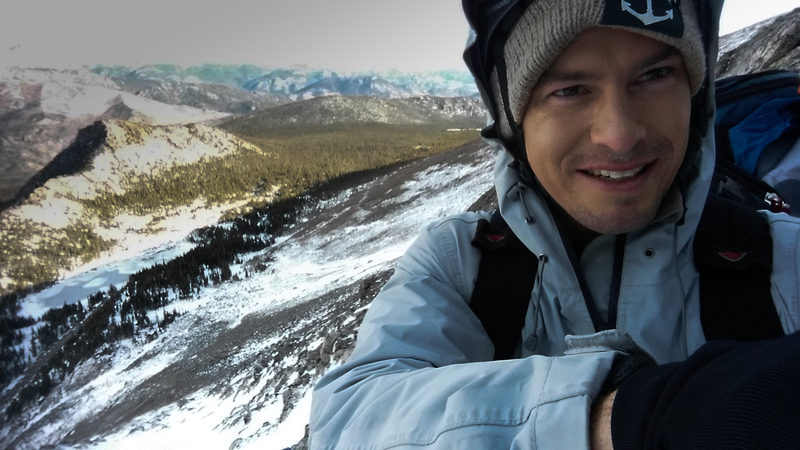 The kind of snowboarding I aspire to do is known as ski mountaineering, which combines backcountry skiing with mountaineering techniques in order to open up the possibility of accessing amazing and uncrowded terrain. The avalanche course I took was just the tip of the iceberg in requisite knowledge one needs for going off piste. 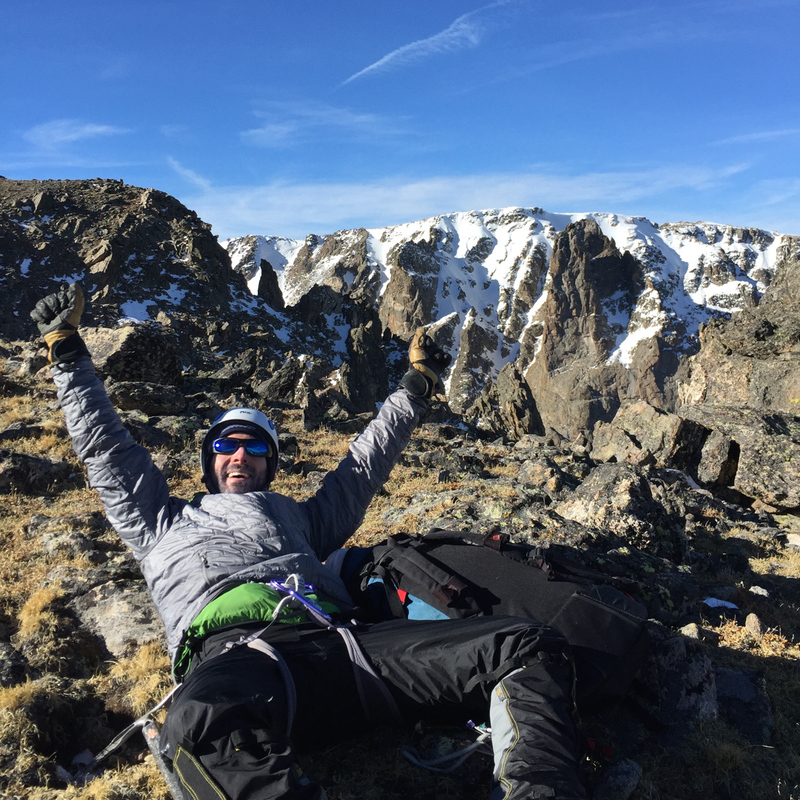 In order to actually earn an entrance into the sport of ski mountaineering I would need to learn mountaineering skills: multi-pitch rock climbing, proper use of crampons and an ice axe, and most importantly the experience one gains from actually practicing these skills in the mountains. 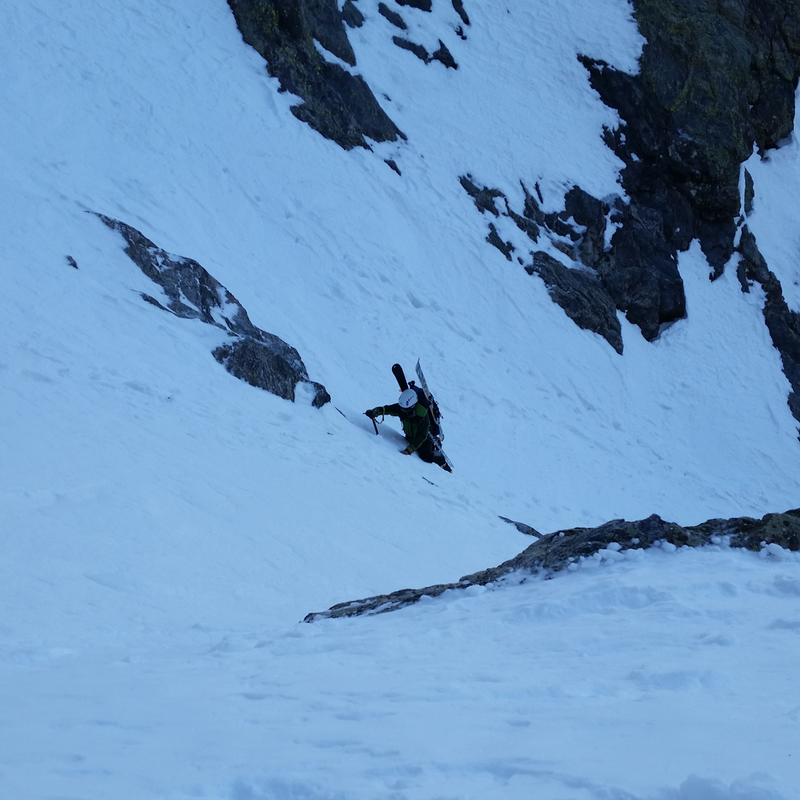 When I was in the backcountry near Bariloche (see my Refugio Frey post here) I was blatantly unsafe when I went bootpacking up the Principal couloir. 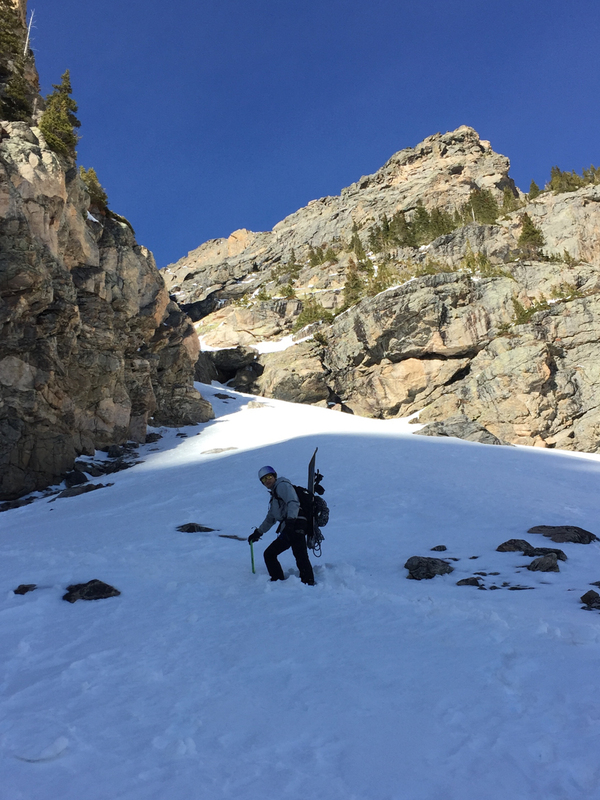 The snow just under the thin layer of powder was hard packed and icy and I bootpacked up the couloir, which was 30 degrees in some place, without crampons for traction or a mountaineering ice axe for self-arrest. While walking up if I had slipped it likely would’ve meant I would rapidly accelerate downhill and eventually tumble over rocks with broken bones being almost guaranteed and potentially death if I was unlucky. At the time I knew the danger and took each step cautiously, but I probably shouldn’t have climbed that hill at all. 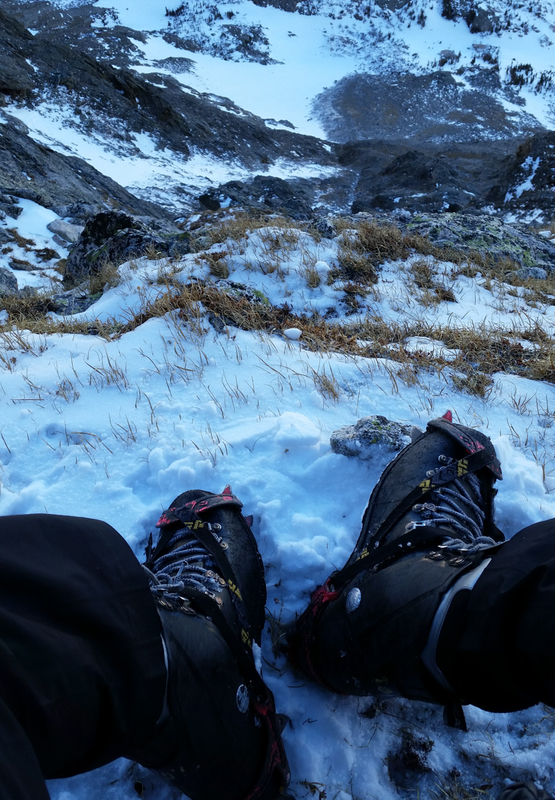 After that experience I told myself I would need to take a proper mountaineering course as soon as possible to learn the important skills I lacked and to better prepare me for ski mountaineering. And so I flew to Denver to meet up with my friend Colin. The course would begin the next day, a Saturday, and was 5 straight days. Colin lives in Boulder and we’d stay at his house, driving 40 minutes each day to Estes Park where the Colorado Mountain School is located. 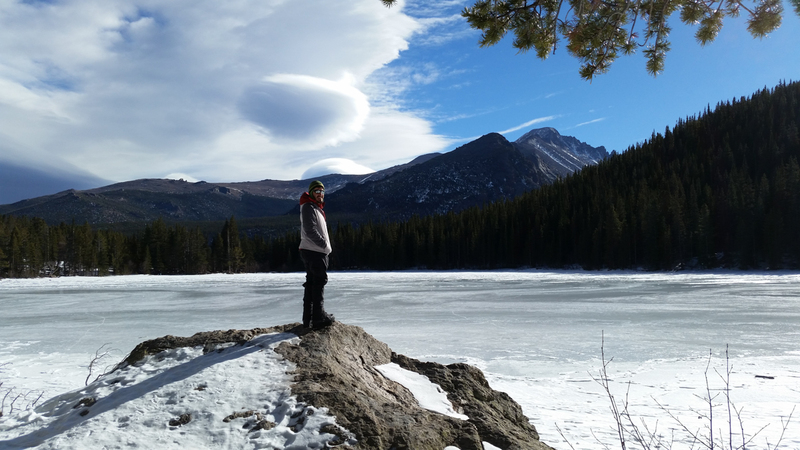 The real learning would happen in the beautiful Rocky Mountain National Park (RMNP), just outside of Estes Park. Another plus of taking a trip to Denver is that my grandparents live there, so after the course I’d get to spend a few days with them. 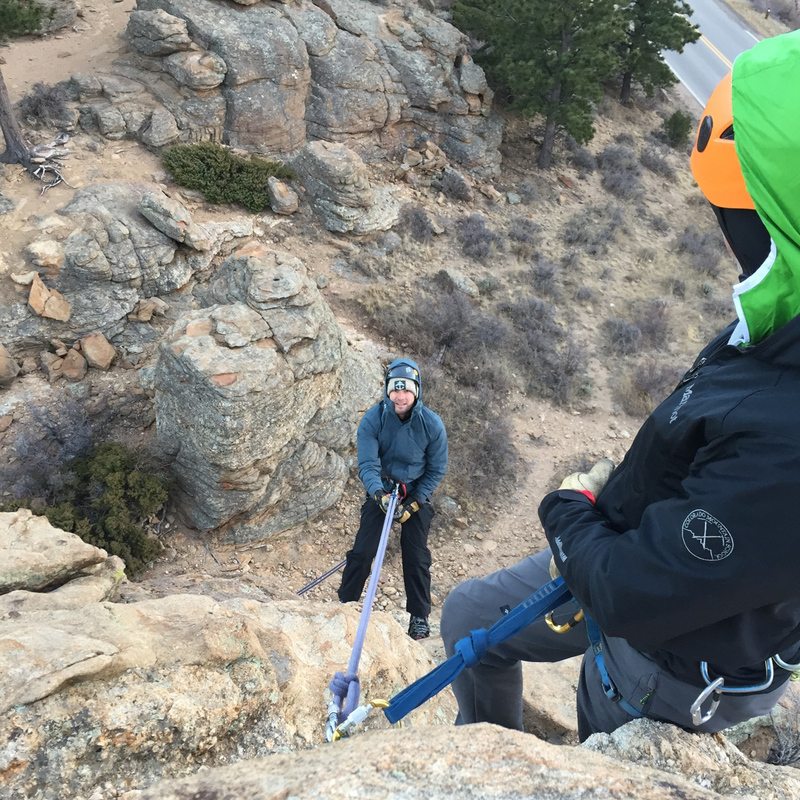 The Intro to Mountaineering Level 1 course was great beyond my expectations. Our instructor was a guy in his early 50’s named Bob Chase, but he looked at least a decade younger than that. 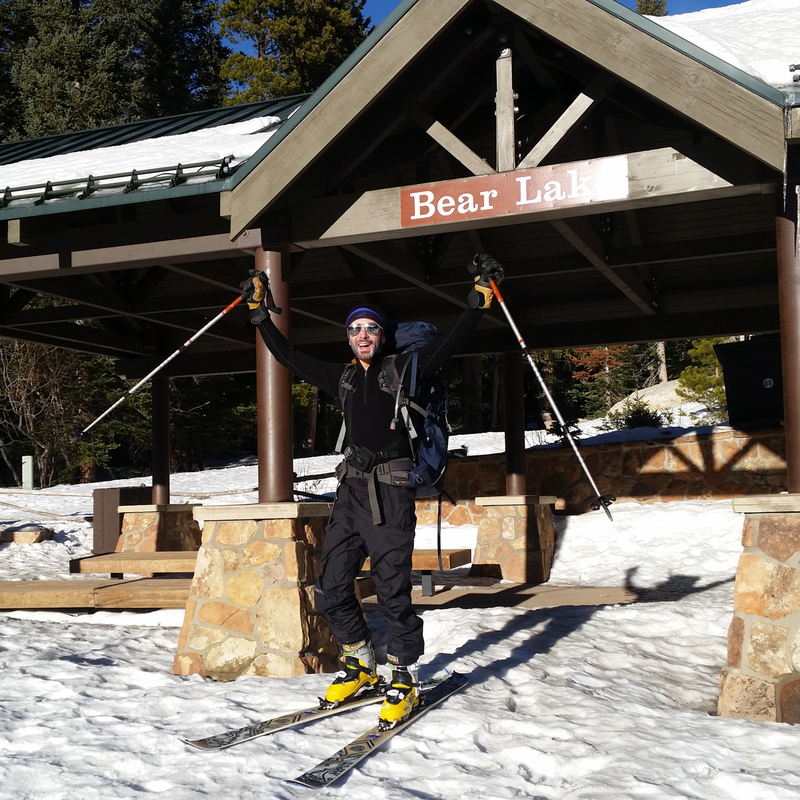 I really think being a mountain guide may be one secret to the fountain of youth; it makes sense that being outside everyday doing what you love would keep one young and healthy! Bob was also the most experienced guide at the school, having worked there for over 20 years, and he was an awesome treasure trove of information whom we could ask endless questions about anything related to mountaineering. Over the course of those 5 days I learned an immense amount from Bob, who would patiently explain every detail of what we were learning and ensure I was practicing the skills correctly. There were 5 students total, and the 3 others besides Colin and myself were all 20-something dudes whose experience varied from very little (in my case) to some rock-climbing experience. We all had much to learn. 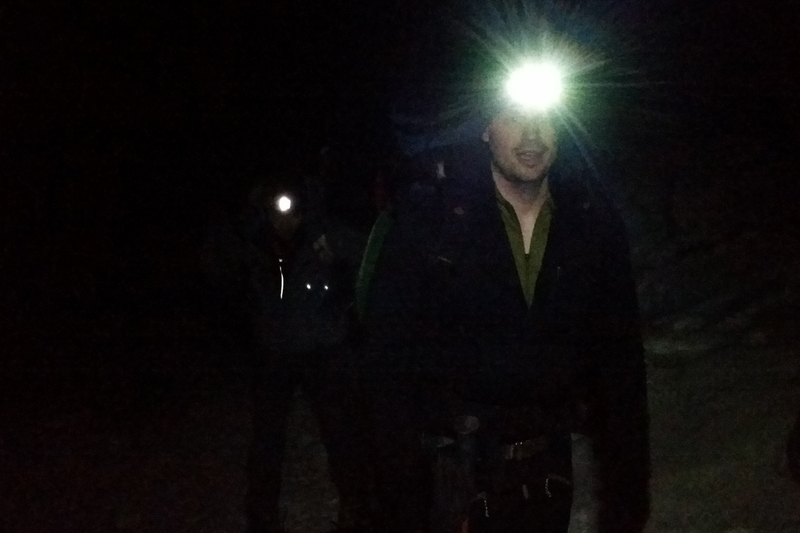 Day 1 – First we grabbed our rental gear: climbing harness, hard plastic mountaineering boots, crampons, and backpack. We spent 3 hours discussing our backgrounds and gear. Mountaineers depend 100% on gear and having a good system down to each little detail is crucial for success in hostile alpine environments. After the discussion we left and spent the afternoon climbing a simple rock formation near the school. 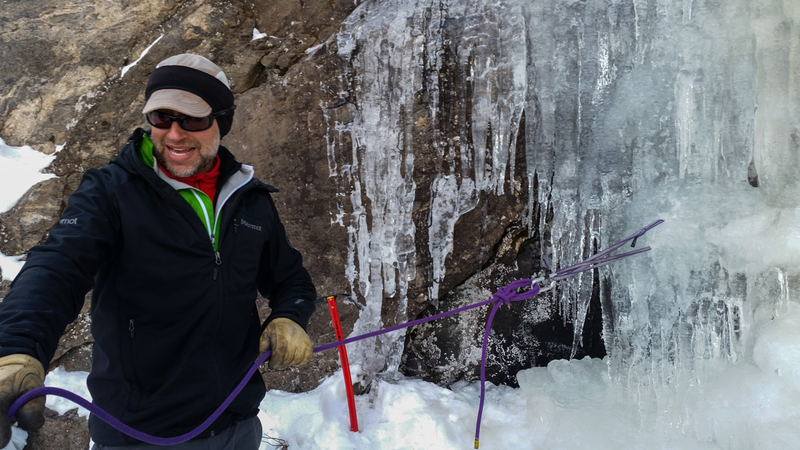 I learned how to top rope climb (in crampons, no less) and how to belay. It was my first time rock climbing with a harness and ropes. First time rock climbing with ropes and I’m wearing crampons! 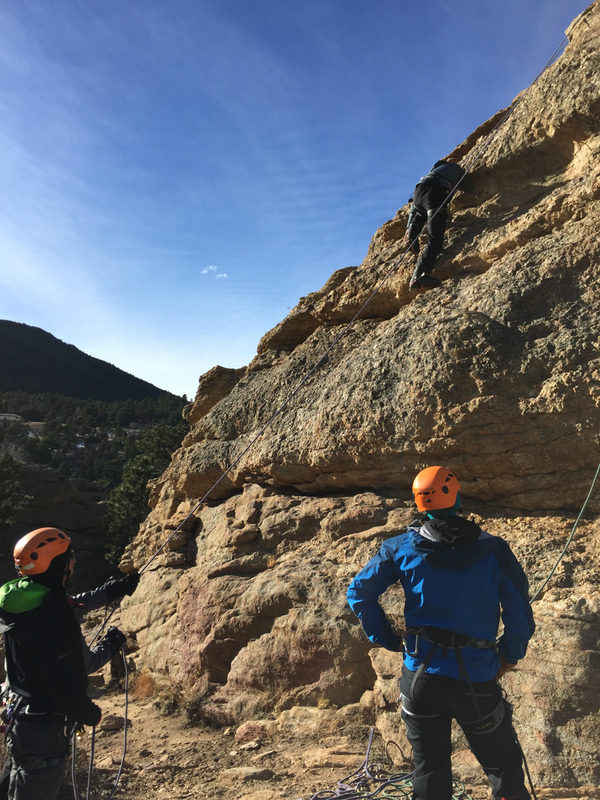 Day 2 – This day was about learning how to multi-pitch rock in an alpine environment. 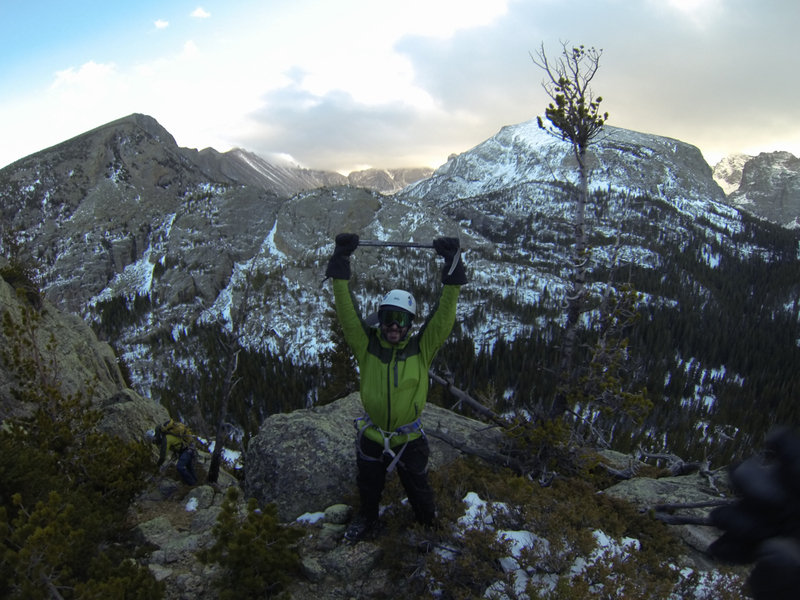 We snow-shoed into Rocky Mountain National Park (RMNP) and did a 5 pitch climb in terrain that was relatively simple. We probably didn’t really need to be roped up for the climb, but this was all about practicing rock climbing techniques. After climbing up we did a big and serious belay down a vertical rock face, which was pretty cool. 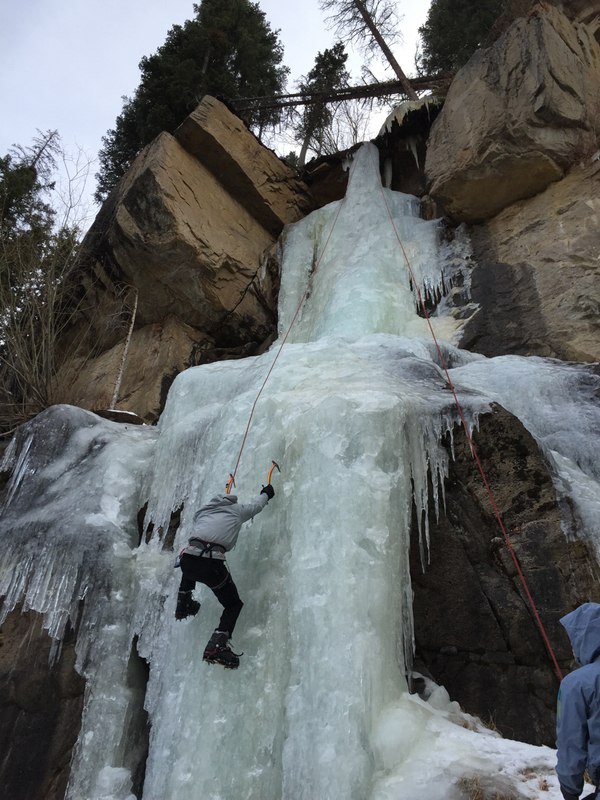 Day 3 (December 8) – For my 31st birthday I went ice climbing! 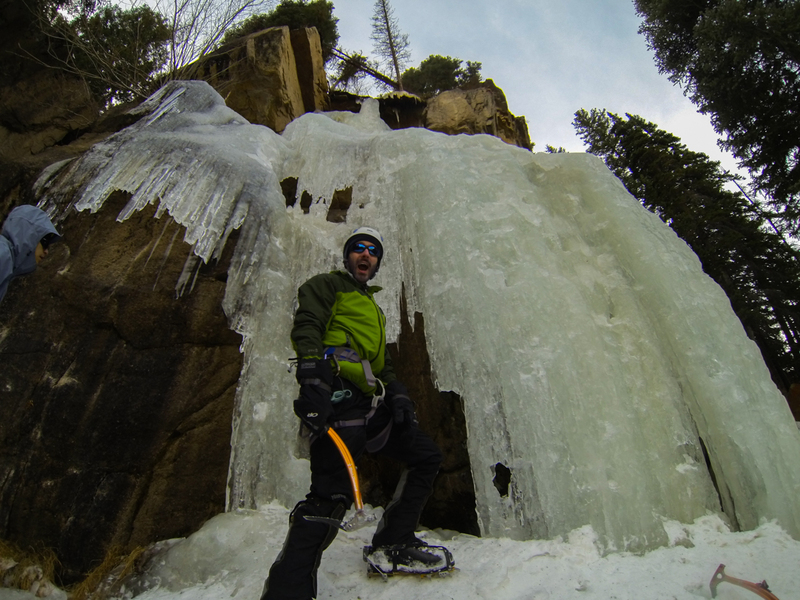 In RMNP we walked to Hidden Falls where Bob setup a top-rope system where we could safely practice ice climbing. For me ice climbing was really difficult. I became very familiar with getting “pumped out”, which happens when climbers’ hand/wrist muscles are completely fatigued from gripping extensively. 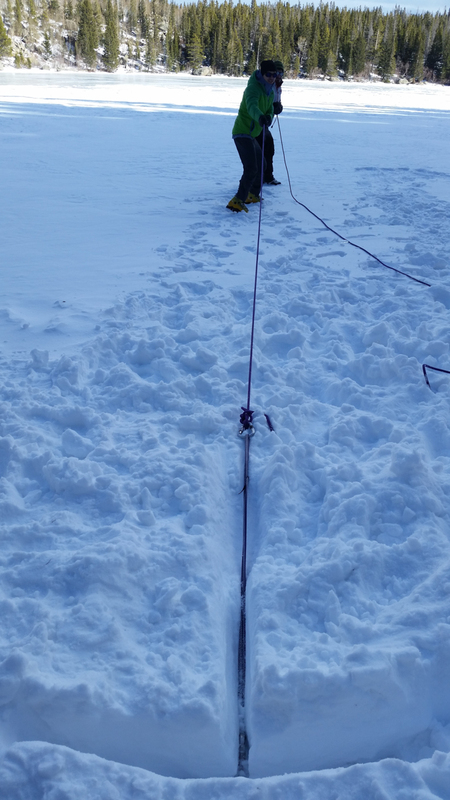 My climbing was slow, mainly because I wouldn’t trust my crampons to hold onto the ice, but the reality is it is amazing how such a small point of contact on the crampon can secure one to the ice wall. I want to practice more! It was a whole lot of fun and a great way to spend my birthday. 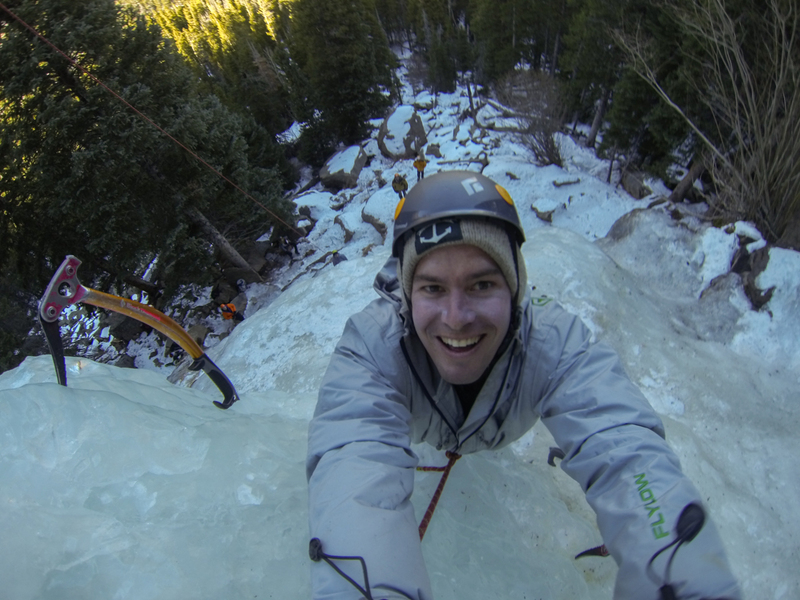 Of course i took a selfie when I was half way up the ice falls! 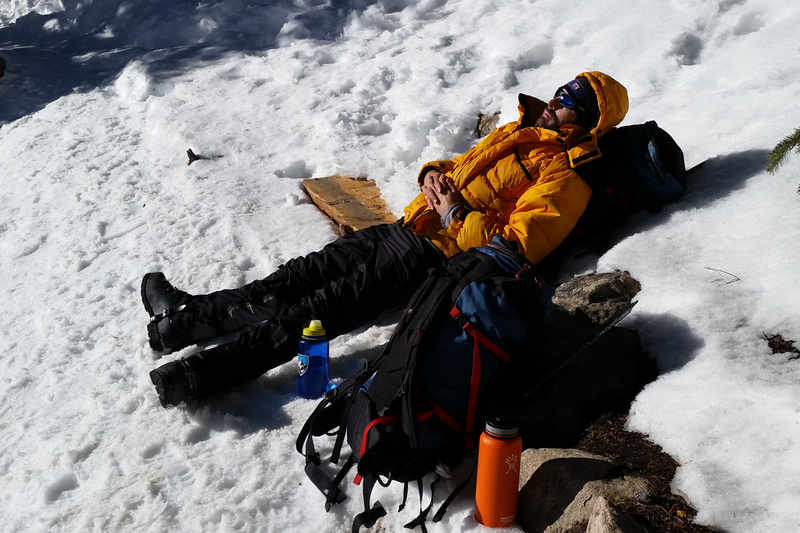 Day 4 – This was kind of a rest day in that we did not climb anything, instead practicing snow skills. We spent the day learning about ice and snow anchors, learning to use an ice axe to self-arrest and practicing beacon searches. 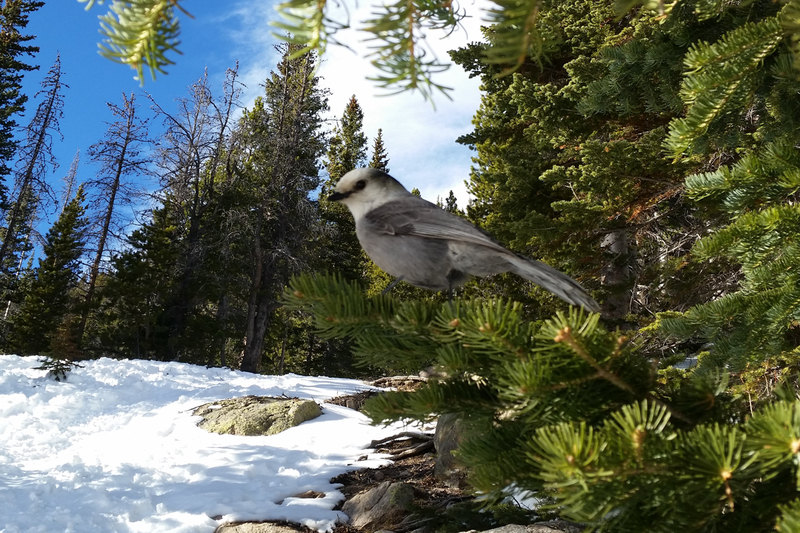 These white jays were super smart and would literally swoop down and grab stuff out from your hands if you weren’t paying attention. It even happened to Bob after he warned us! 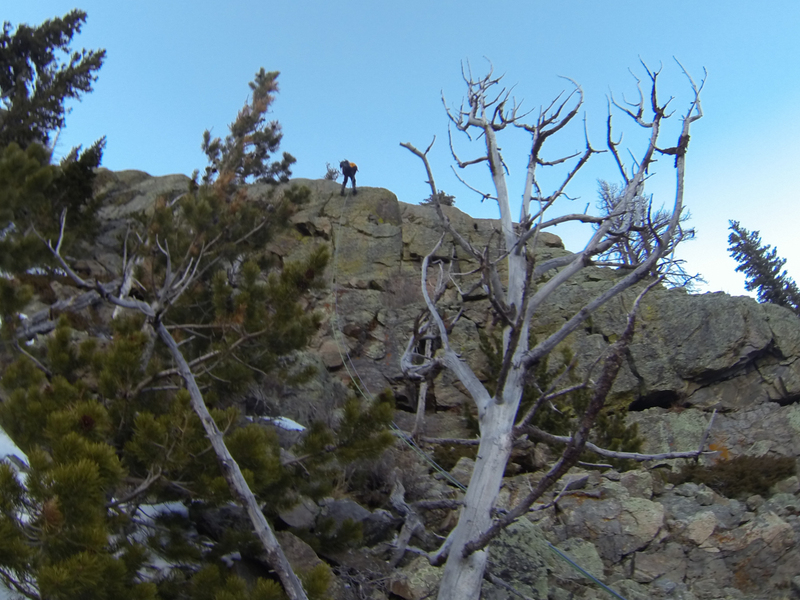 Day 5 – The final day we would climb a route affectionally called “Bob’s Route” to the top of Flattop Mountain in RMNP. The day began with an alarm at 2:30am so that we would be at Estes Park no later than 4:30am and on the trail in RMNP for a late “alpine start” at 5am. Usually when climbers attempt mountain ascents it behooves them to start the day well before dawn because snow conditions are usually firmer and safer earlier in the day, hence the concept of an alpine start. 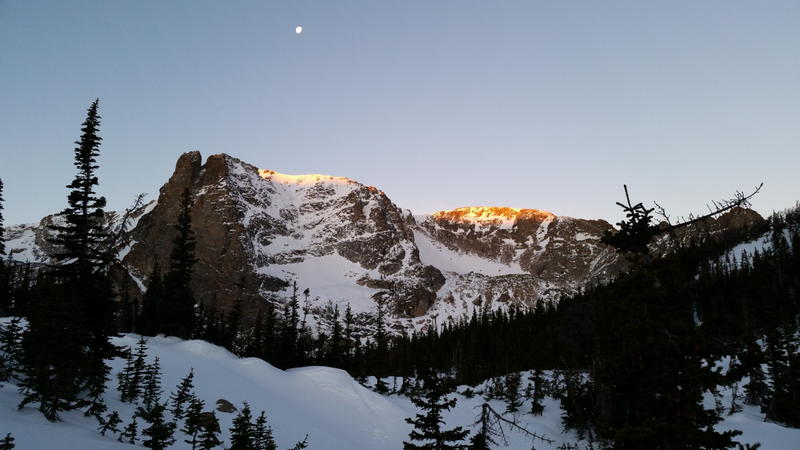 After snowshoeing towards the base of Flattop, at daybreak we watched the alpenglow hit the crest of Notchtop Peak and simultaneously the moon was setting over the mountain, which made for an awesome photo. The first several hundred feet of the climb was over semi-steep talus but by around 11am we reached grade 5 terrain and it was time to begin rock climbing. 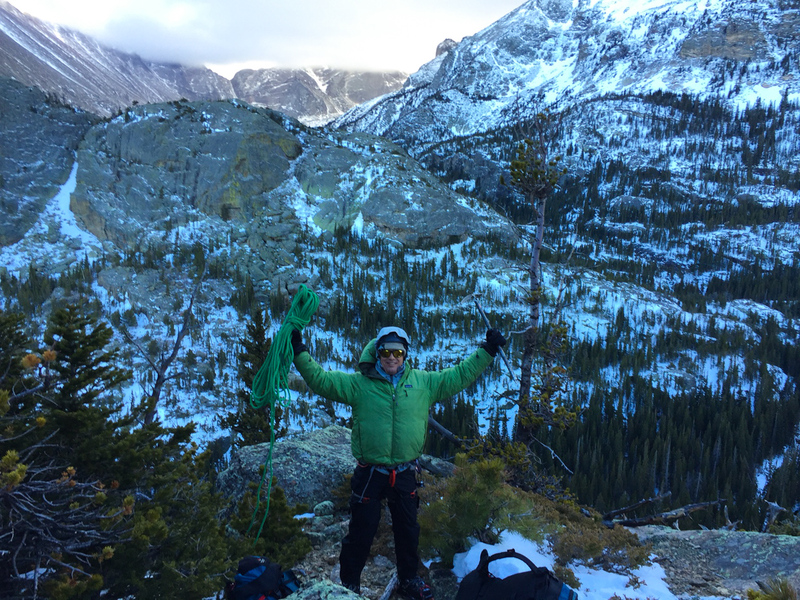 We roped up and Bob led the route up for myself and 2 other students, with me being the last climber so that I would collect the gear Bob placed for protection. Colin and the other more advanced student went with a 2nd guide up a more difficult route. There were parts of our route where without a rope for safety, a fall would’ve meant certain death after tumbling hundreds of feet. Even falling with the ropes would’ve been painful as you’re going tumble down rocks for at least 10 or more feet before the rope saves you. The photos really don’t do it justice, this was terrain unlike anything I’d experienced before and I was scared but exhilarated at the same time. Rock climbing is pretty rad! We made it to the top around 2:30pm and then descended by walking down a snowy slope on the not-so-steep part of the mountain. Alpenglow hitting the crest of Notchtop Mountain. You can see the moon hanging high in the sky. 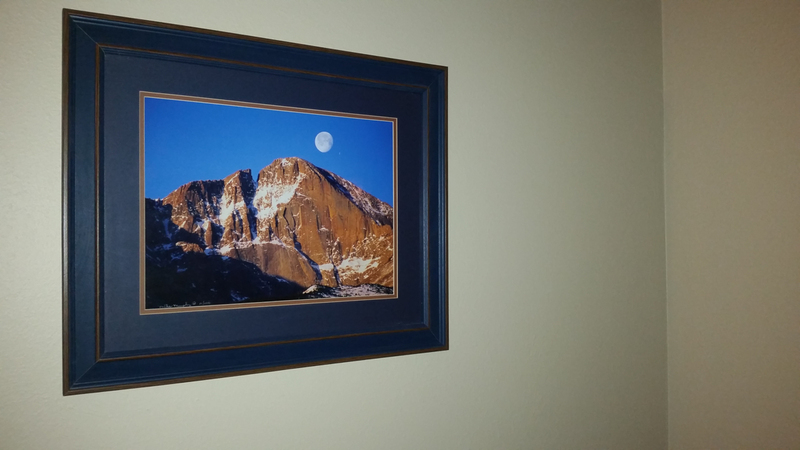 When I got back to Colin’s house, which he is renting fully furnished, I noticed this photo on the wall of his study… and realized that it was pretty much EXACTLY the same photo that we had experienced in person (and took a similar picture of) that day! This photo has the camera pointed basically straight down. It’s hard to tell, but this was some STEEP terrain we were climbing. 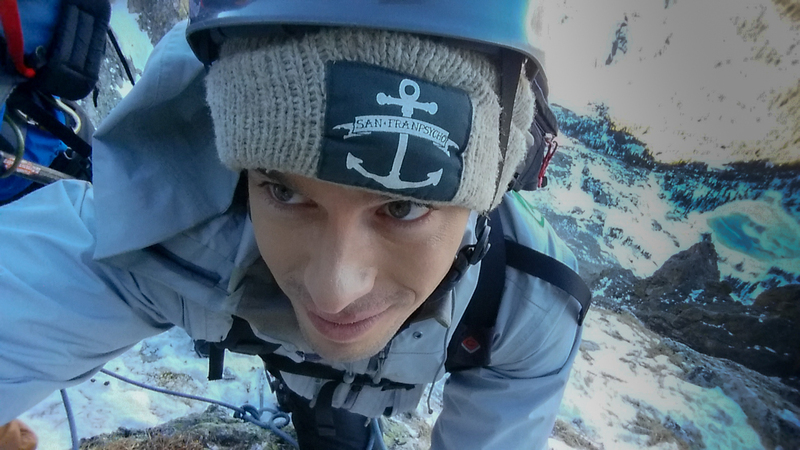 Selfie while in a critically steep location. I’m worse than a teenage girl with selfies, apparently. Dominic and John just before we finished our ascent. 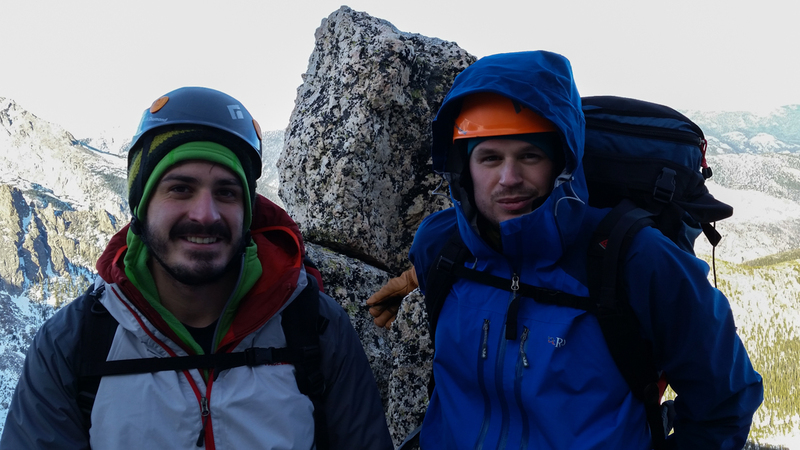 Colin and I were super amped from the course and decided we wanted to head back to RMNP with the objective of skiing down the Dragon’s Tail Couloir. We spent Thursday relaxing going shopping for necessary gear and I bought a harness, crampons and an ice axe. 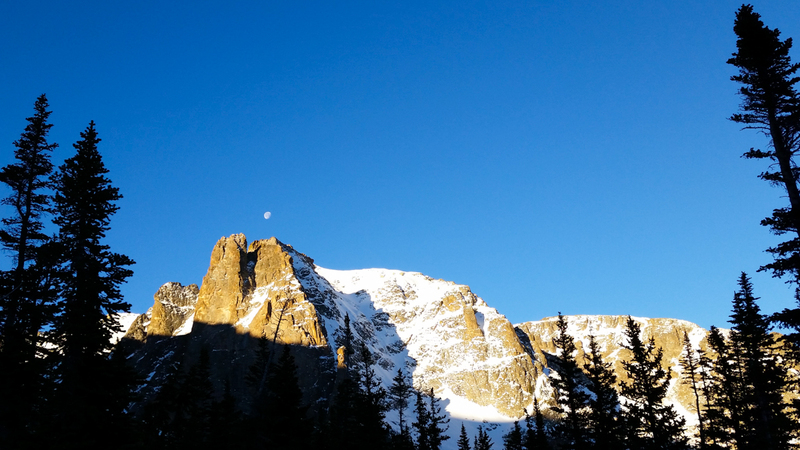 On Friday we yet again woke up well before dawn and drove straight into RMNP. The walk to the base of the couloir took about an hour and a half, but we really didn’t get started climbing up the couloir until nearly 10am. Three other skiers started climbing up a little before us and there was a nice bootpack trail for us to follow up. Early on we knew we wouldn’t be needing rope to climb up, but we were fully prepared with rope and harnesses just in case we felt they needed more safety. By 1pm or so we reached the highest point we felt comfortable going. To ascend the last one-third of the couloir it would’ve been necessary to rope up in order to get over a rocky section, but we were running out of time as the snow, which had been in the sun earlier in the day, was stiffening up as the couloir became shaded. At one point we did use the rope down-climb a steep section, but going up and down that short section was really just for getting in some rope practice. 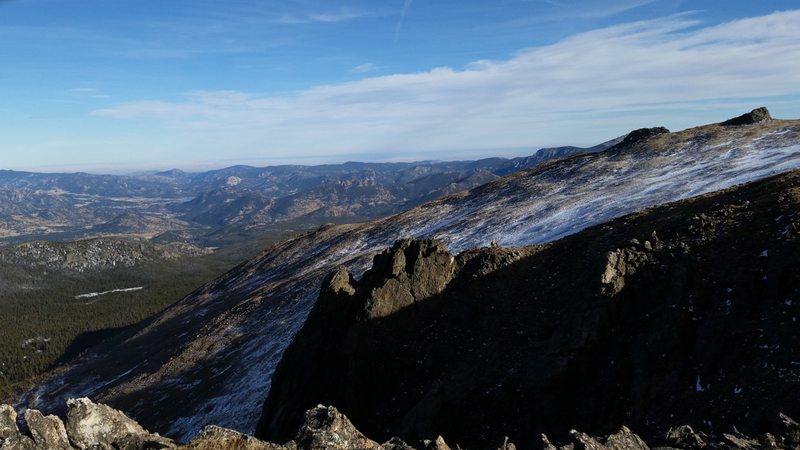 The view from our highest point was pretty awesome but I was worried about the snow quality for the descent, as it seemed super crusty and potentially icy. In the end my edges held fine the descent was fun although the snow was not good. 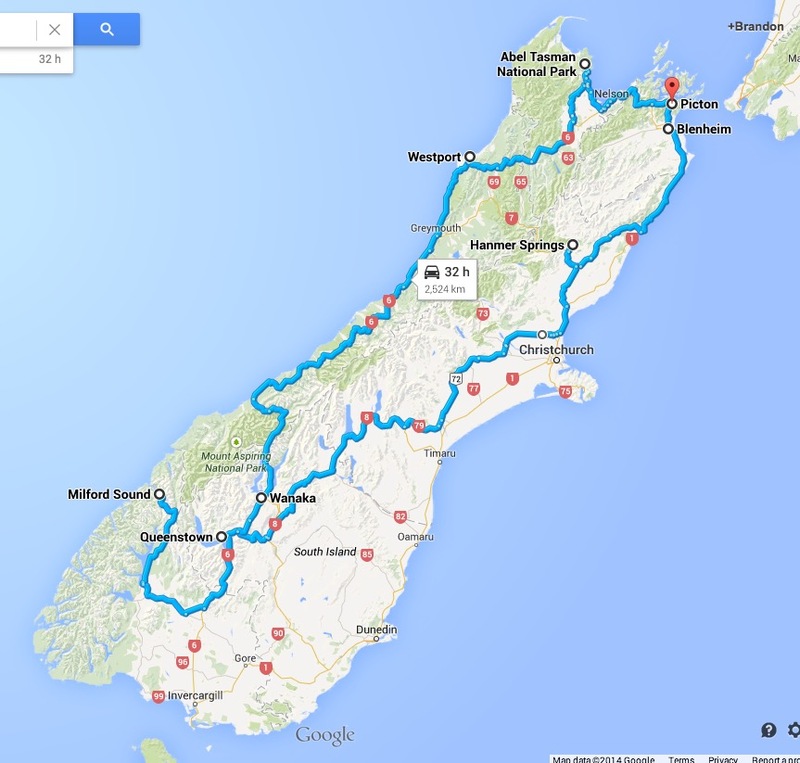 Colin and I were stoked on the trip and I envision future adventures for the two of us! 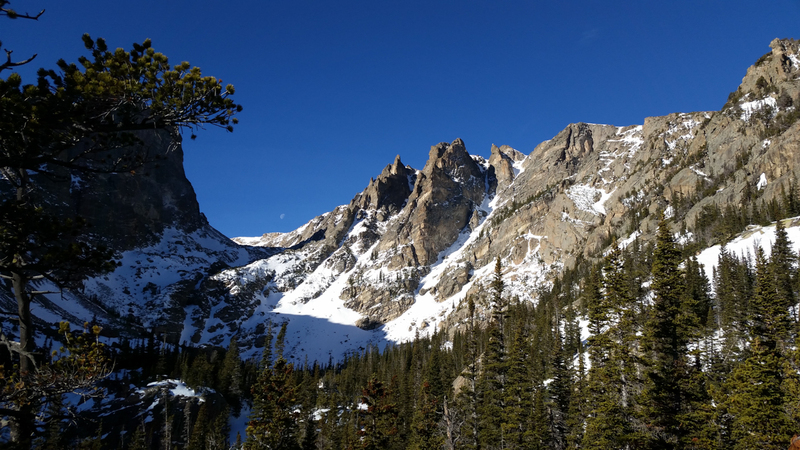 Our first view of the Dragons Tail Couloir, which is in the center of the pic. Notice the moon setting towards the left just above the ridge line. 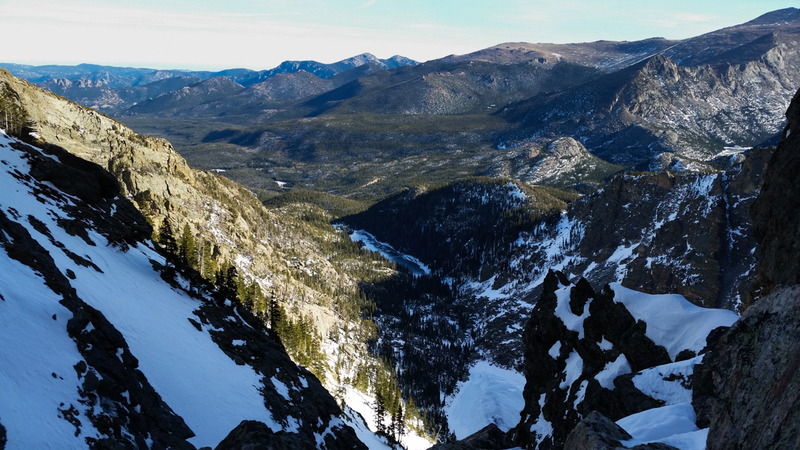 View of Emerald Lake and the valley from the highest point we went up the couloir. I think we hiked up about 1800 feet from the lake below. If we wanted to go all the way up the couloir, we would’ve taken the route you see in this photo. The rocky band presented a difficult obstacle and we didn’t feel we had enough time to complete the full objective to the top. 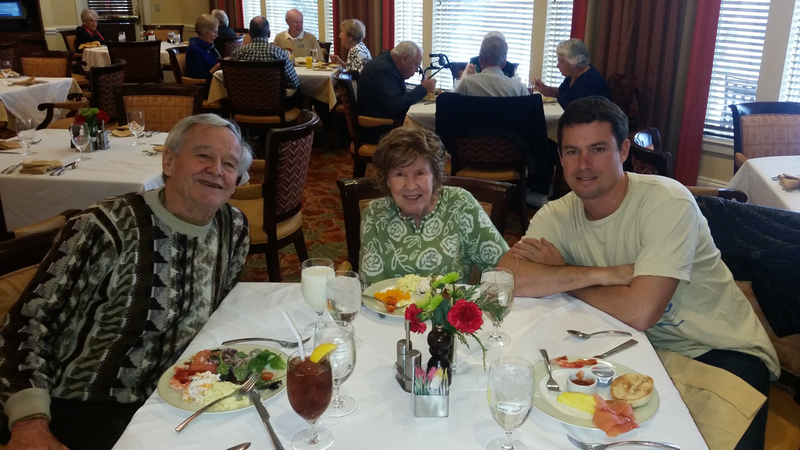 The next day was Saturday and I was more than ready for some rest & relaxation when my grandpa came to pick me up that morning. That weekend I hung out with grandma and grandpa, sleeping well, eating well, and talking with them about anything and everything. They’re always so stoked when I come to visit and it makes me happy to see them. I watched the Broncos clinch the AFC West division, which made gramps happy. Grandma is getting a little loopy as she suffers from Alzheimer’s but sometimes she cracks me up with her ridiculous comments. On Monday morning I headed back to the airport and flew back to San Francisco. Donna and I would arrive within an hour of one another and would spend a few days in SF before heading to Florida for family time through Christmas. Thanks to Kelsey for letting us stay in her room!